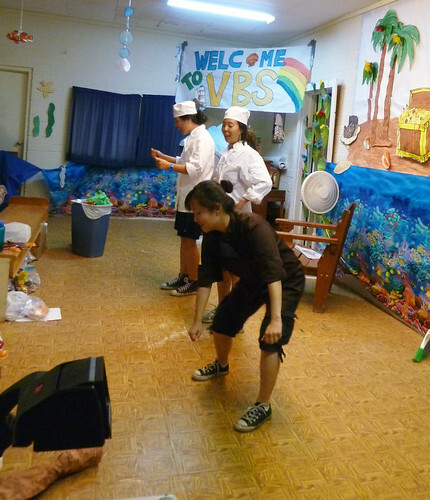 A big chunk of the activities we did in Arizona during the VBS (Vacation Bible School) is to put on fun skits that will not only grab the attention of the kiddies but also teach them a fundamental element of the Bible and God. The skit was actually about a Master Pastry Chef (played by me) and her two apprentices. The Master Pastry Chef was the chef of a world famous chocolate bakery and she hand selected two apprentices to take under her wing. I even brought my chefs coats and the hats I used to wear when I was in culinary school. Oh man, wearing that jacket in the 104 degree weather was NOT fun. But I think the kids got a kick out of it. 1. Chop a HUGE bar of chocolate into little itty bitty pieces. 2. Melt all the chocolate chopped the previous day. 3. 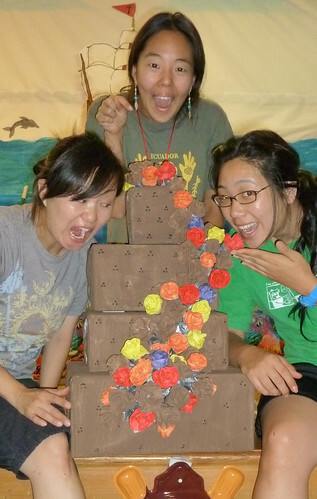 Make a beautiful chocolate cake. After each task, the Master says that if they have any questions or need help that she's available. Each step of the way both apprentices mess up but one always goes back to the Master to ask questions and the other tries to figure it out herself. In the end the apprentice who always goes to the Master to ask questions makes the most gorgeous chocolate cake! The moral of the story? God is like the Master Pastry Chef, He gives us certain tasks to do but He never tells us we have to do it alone. In fact, when we go to Him for help or with questions He often equips us to do more than we ever thought possible. It was a fun skit. We had some great actors! 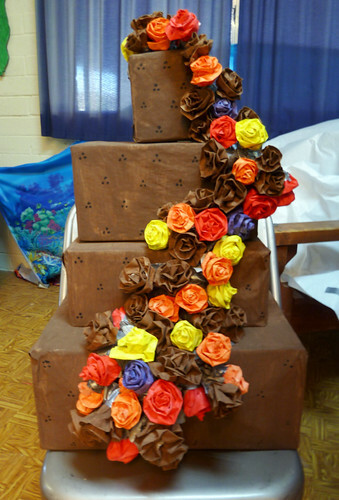 But those roses/flowers.. man it took forever!!! 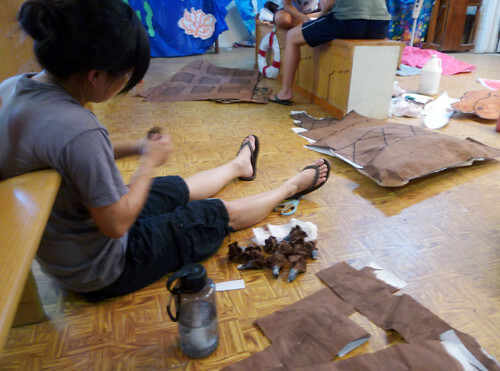 We had to paint butcher paper, cut the paper, then make them one by one. It's almost as labor intensive as sugar roses! But it looked so beautiful! Another team mate and I worked really hard on it and we were very proud of it. See Ya Later CA... Hello AZ! !